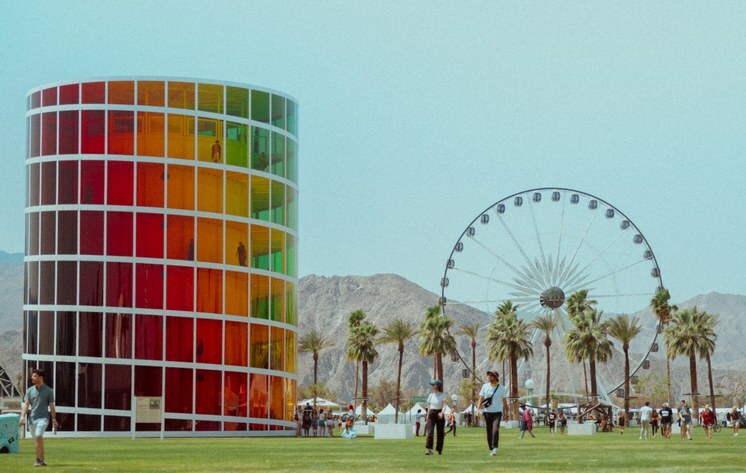 Coachella Valley as crucible of creativity? Art fairs now are a dime a dozen in cities around the world but geniune art festivals, places where artists make work for the privilege of creative engagement— not so much. Where does this take place? The High Desert, the expansive, under- populated regions around Palm Springs. New Substance, Spectre, 2018. Photo courtesy of New Substance. This is, I believe, the biggest congregation to date. Desert X launched the season in February over 198 miles stretching from the western edge of Palm Springs to the Salton Sea. Neville Wakefield, curator of the 2017 debut as well as this version, selected wisely. 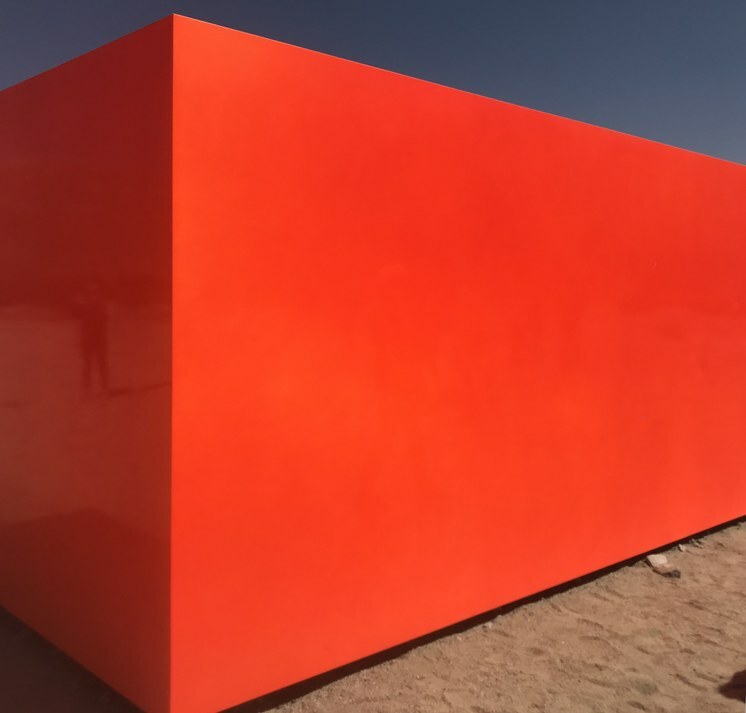 Major pieces by well-recognized artists provide the draw: Sterling Ruby’s glowing blood orange rectangular cuboid could be seen from the 111 Freeway and attracted crowds easily. 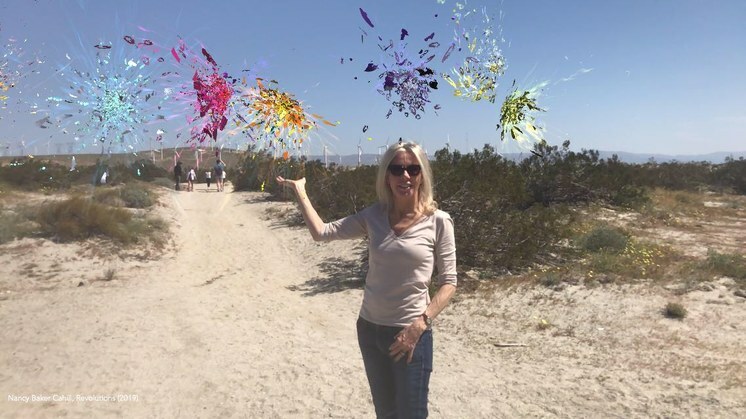 Hilary Baker Cahill invented an augmented reality program that brought people from far afield to stand in the middle of the desert to look at the landscape with added bursts of her own color. Her work acknowledges yet intervenes with what we all know, that the nature now is experienced digitally on your iphone. 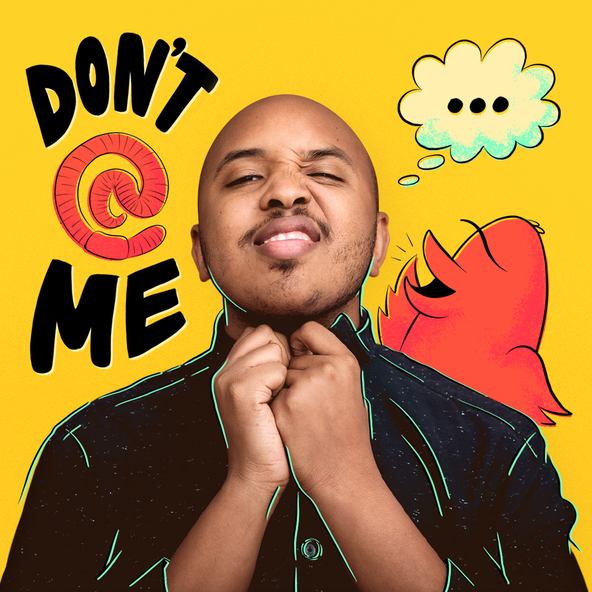 Organizers try to involve the communities but clearly there are some who are less than welcoming to well-heeled outsiders, artists or viewers, who treat their neighborhoods as curiosities. As a result, two works have been removed but the rest remain through April 21. Bombay Beach Biennale, 2019. Photo by Hunter Drohojowska-Philp. 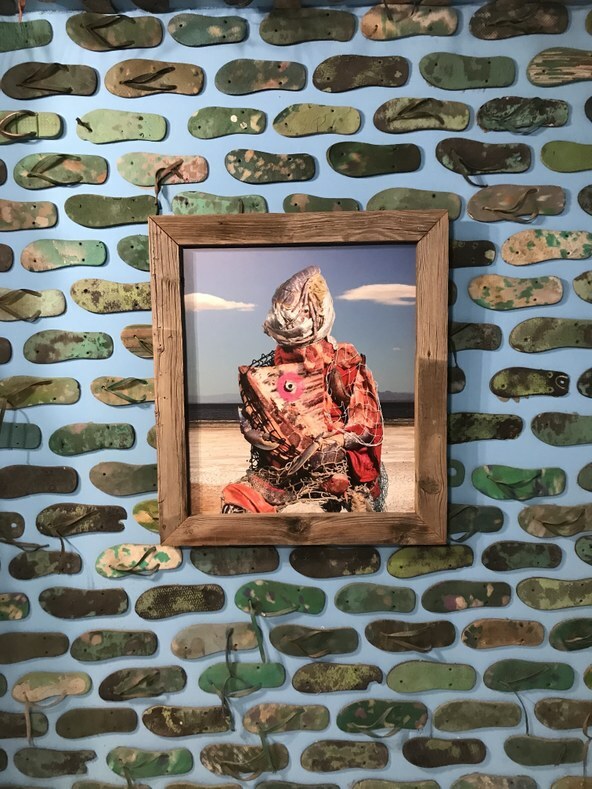 This is only the second year of Desert X and the first to venture all the way to the Salton Sea where it is possible to see works in the mischievously titled Bombay Beach Bienniale,which is actually held annually. Privately funded and organized by Stefan Ashkenazy, Lily White and Tao Ruspoli, in some ways it is the most interesting of the events. Welcoming visitors with a broken ferris wheel that has only one seat and a Showtime sign, many of the small houses and mobile homes around Bombay Beach, at the southern tip of the massive inland lake, have been transformed by artists such as Greg Haberny, Timothy Uriah Steele and James Ostrer, who created a wild performance hall and installation of his own photographs. Yassi Mazandi’s giant white flower sculpture is backed by a MRI-derived digial projection. Yassi Mazandi. 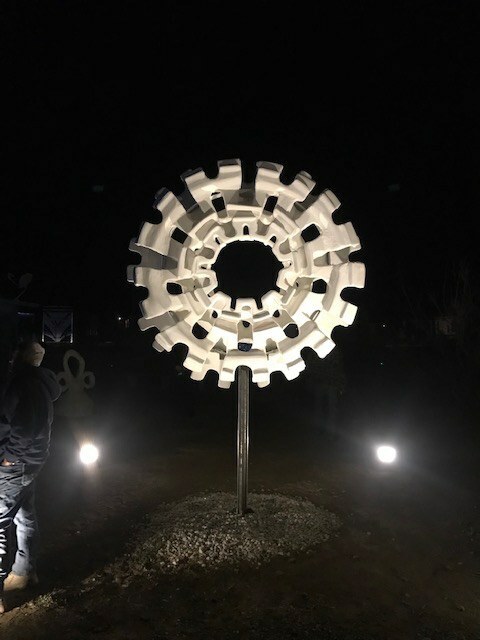 2018 Sculpture at Bombay Beach Biennale. Photo by Hunter Drohojowska-Philp. Kathy Suder’s photographs of the homeless and illuminated field of small tents titled Everybody is Somebody. 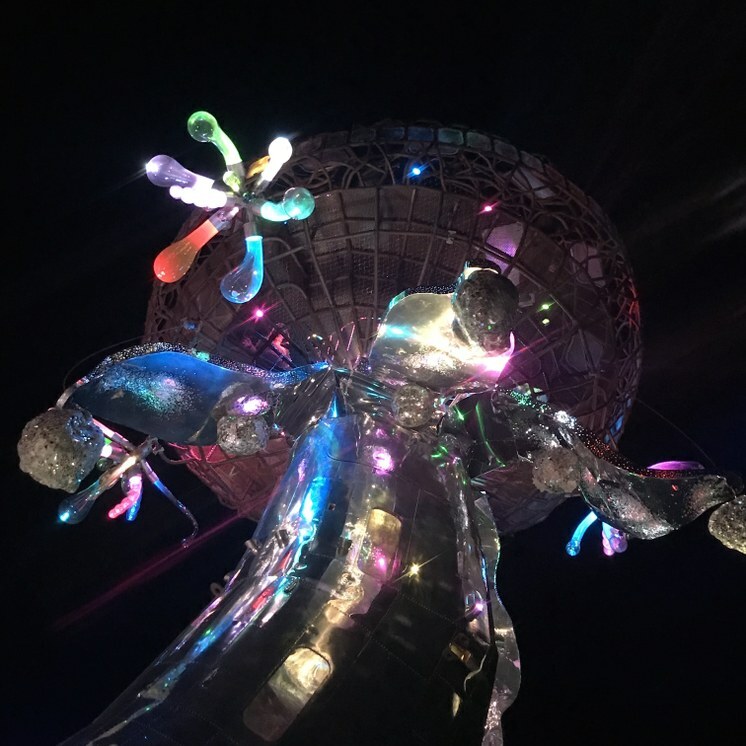 Little of this would have evolved without the success of the Coachella Valley Music Festival, now in its 20th year, which has been adding to its roster of giant art experiences such as the tower of light, Spectre, by New Substance. There is some overlap. 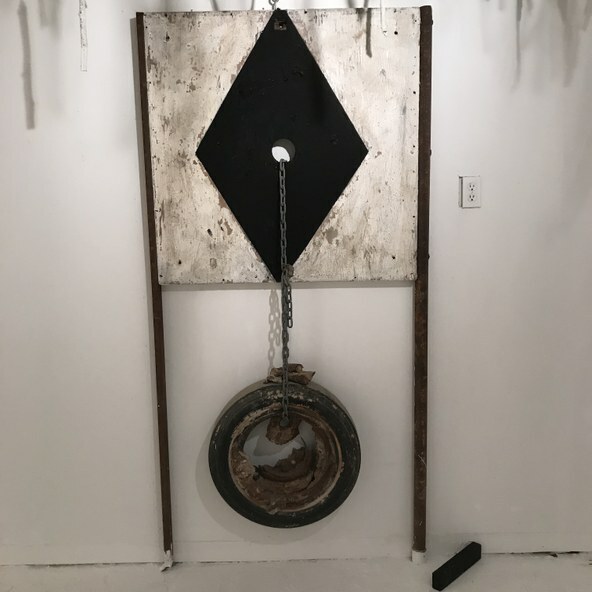 Two pieces by Randy Polumbo, including the marvelous dystopian Lodestar, previously at Coachella, are now on view at Bombay Beach. bombaybeachbiennale.org . This is also the weekend of the Joshua Treenial, a gathering to the north of the area organized by Bernard Leibov of BoxoHOUSE with curator KJ Baysa. 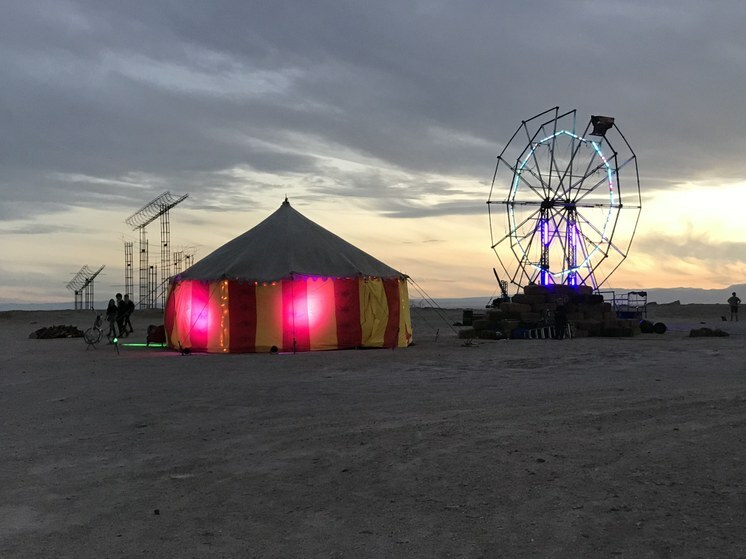 Art Queen, High Desert Test Sites and other cultural partners are involved with these events, notably The Integratron, where performances take place from 7 p.m.on Saturday. An extension of Desert X, this year’s show, Paradise::Parallax with two dozen artists, is ONLY on view this weekend, April 12-14. Much of the work draws attention to the environment and ecology, most importantly the preservation of the Salton Sea. This weekend offers a uniquely Southern California art scene in the High Desert complete with wild flowers and warm weather, enjoyable with or without the music.